Are you suffering from Chronic Lower back Pain? You may be able to find long-term relief in weeks using a course of Alexander Technique lessons —even if you think you’ve already tried everything. 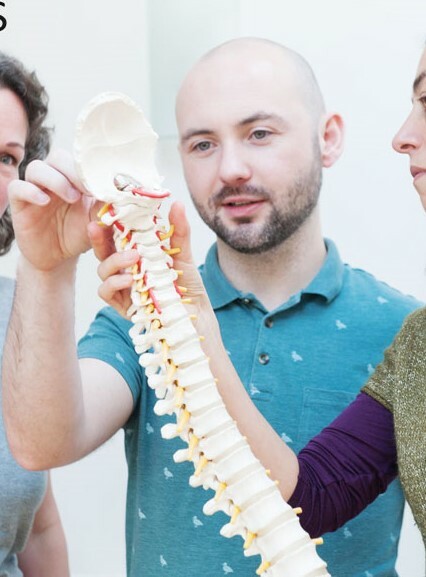 Andrew Monaghan is a STAT qualified teacher of the Alexander Technique, an educational process that a BMJ (British Medical Journal) study concluded was highly effective at relieving back pain. This incredible process can help you relieve back pain — often permanently. Andrew is also trained in a specialised version of Alexander Technique called LearningMethods, which helps to make learning and application easier and more effective. …and when researches conducted a follow-up study one year later, patients who received Alexander Technique lessons remained free from back pain. With conventional therapies, the focus is almost entirely on treating symptoms of back pain. This is fine when it’s something like an injury. But chronic back pain is often caused by how people use their body as they go about their lives. So even when chronic back pain sufferers get relief from approaches like physio, chiropractic, osteopathic, etc. They go back into their lives with the same habits that caused the pain to begin with. So, while various treatments can and do offer relief, the pain often returns as they leave the treatment and continue doing the same things that cause the pain in the first place. This is why so many people find their pain keeps coming back, again and again. What makes the Alexander Technique different is that the sessions don’t just get rid of lower back pain, but focus on finding the cause of the pain. By finding and removing the cause, there is no longer a reason for pain to occur. Through a course of lessons, you learn to improve poor posture and change bad habits that can lead to back pain and strain. Andrew Monaghan has been a student and teacher of the Alexander Technique for over ten years. A course of lessons will vary in length depending on a person’s current state, needs and goals. More on this below. What Causes (most) Back Pain? Up to 97% of all chronic back pain cases are diagnosed as “non-specific” or “mechanical” in nature. These types of back pain are often the result of excess muscle tension often caused or exacerbated by unnatural body mechanics or “poor posture”. In other words, for most of us, our back pain is not caused by old age. It’s not caused by genetics. And it’s not a serious underlying issue. Most back pain is the result of moving poorly and “carrying ourselves” with unnatural, harmful muscle tension. It’s not that we have a ‘bad back’ that hurts us — it’s that we hurt our back. Since 1-2% of all back pain cases can be of a medical nature, you should always see your doctor. They will be able to rule out any serious underlying issues that could be causing your pain. If your pain is not serious, your doctor will usually prescribe physiotherapy or medication such as painkillers and anti-inflammatories. Your doctor may even refer you for surgery if this has continued for a long time, but this does not necessarily mean your back pain is serious. When we move badly, we are out of balance. This forces our muscles to tense and strain to keep us from falling over. When we move, sit, bend, stand or walk poorly. These tensions and strains can lead to chronic pain, and the forces can cause herniated and bulging discs, among other issues. Most people have no idea that they are out of balance. Their body sends pain signals, but they just think, “this is what it feels like to be standing/sitting /walking”. They don’t know the signals tell them it’s harmful. They just think its “the feeling of effort it takes to do this activity”. While most people are acutely aware of their chronic back pain, most sufferers don’t know what is causing it. Most people make assumptions about the cause of their pain. We say, “I think it’s genetic,” or “It’s just wear and tear from old age.” Few people consider the possibility that it’s something they are doing that could cause their pain. Many even fear that the doctor’s conclusions were wrong and something sinister could be happening that nobody has spotted. After all, how could something so painful, frustrating and deeply upsetting be harmless? While the medical approach is vital for back pain caused by pathologies such as a tumour or stenosis, a growing body of medical research recommends against treating most chronic back pain as a medical condition. While “non-specific” and “mechanical” back pain can be extremely painful and negatively affects a person’s quality of life, it is harmless to your physical health and may be effectively reduced using Alexander Technique. Treatments sometimes provide some relief, but more often than not they are ineffective since the underlying cause just puts them out again. As a result, people give up. They feel they have tried everything medicine can offer, and so if that has failed, it must be a problem with their body. Maybe it’s genetic and something they must learn to live with. Due to repeated failures with treatment, lower back pain suffers frequently feel exasperated and depressed. It is not uncommon or people to admit feeling suicidal as a result of chronic pain. They feel that they have tried everything and nothing is working, and so they return to their doctor as they begin to suspect that if all the things they’re told to do aren’t working, there must be something wrong. But more often than not, the doctor says that they only have signs of “normal wear and tear”, and the issue is not medical. This can leave sufferers feeling even more frustrated and hopeless. They feel there is no hope and they are distrustful of trying anything new. It is usually at this point that people come for a course of Alexander Technique lessons with Andrew. What is the Alexander Technique like? Is it like Massage or Physio? The Alexander Technique uses a very different approach that is likely very different to anything you have tried before. It is intensely practical, and everything you learn in a course will be useful towards relieving pain, reducing strain and improving how you feel and how you move. Although it may have parallels in some areas, it is unlikely to be directly comparable to anything you are thinking of. It was once referred to as, “Common sense applied to life”. During lessons, you learn about how you function and how to function better. As an example for the sake of comparison, if you had a sore shoulder and went to a therapist, they would likely work to treat the tense shoulder using various approaches such as massage, manipulation, needling, etc. In an Alexander Technique lesson, you would learn to identify why the shoulder is tense and learn to release it by yourself —your muscles are controlled by your brain. It makes more sense to tackle the tension from there; if the brain continues sending signals for the muscles to tense, treatment is going to have a limited long-term benefit. During the lesson, you might also learn why it might be tensing up in the first place. For example, say you discover that in your everyday life you use too much force to hold the steering wheel in the car and this over time led to chronic shoulder pain. By changing this particular habit, you tackle the cause of the shoulder pain. And it stands to reason that if you stop doing the thing causing the shoulder pain, the benefits are going to be long term and benefits will remain permanent unless you revert to that old habit or hurt your shoulder in some other way. During the lesson, you might also learn why it might be tensing up in the first place. For example, say you discover that in your everyday life you use too much force to hold the steering wheel in the car and this over time led to chronic shoulder pain. By changing this particular habit, you tackle the cause of the shoulder pain. And it stands to reason that if you stop doing the thing causing the shoulder pain, the benefits are going to be long term and benefits will remain permanent unless you revert to that old habit or hurt your shoulder in some other way. Each change you make will create an improvement, each improvement building on the next until they find yourself with greatly reduced pain and operating in your life in a way that is overall easier. Through this work, back pain sufferers can finally figure out the exact cause their pain and change the behaviour so that the pain is no longer an issue. How many lessons will I need and how much does it cost? How long it takes depends on how ingrained your habits are. Every person is different, but generally speaking the longer you have had chronic pain, the more sessions and time it will take to change. See examples below for a clearer picture. 1. David Duffy had persistent chronic back pain for two years. When he started, he rated his pain at about 4/10. He tried various treatments and self-care approaches, including physio, chiropractic, osteopathy, massage, Yoga and Pilates. They offered improvements, but nothing lasted. He had also spent many thousands on equipment such as chairs. David had a complete removal of all symptoms after eight sessions. He still had no symptoms and no back pain when we did a recent follow-up (three months later). 2. Maura Kenny has had chronic back pain for over 18 years. Before treatment, Maura rated her pain and discomfort at around 7/10 – 8/10. It had been particularly bad for the last eight years with no treatment helping. She tried everything medical except surgery. Before lessons, she had tried treatments such as physio, chiropractic, osteopathy, craniosacral therapy, orthotics, as well as self-care activities like walking and swimming. She felt low, frustrated and highly suspicious of any new treatments after repeated failures. To date (March ’17), Maura has had 18 sessions. She currently rates her pain and discomfort at about 2/10 and is very satisfied with her results so far. We are still in the process of isolating and changing habits that are causing her pain. For example, she recently discovered that she had been leaning backwards while standing and walking. This was not something she had been aware of previously but causes excess muscle tension and pain. How can I find out how many sessions I need? During your first consultation session, Andrew will show you how the approach works and give you useful tips, insights and strategies you can apply in your life right away. At this point, he will also give you an estimate of the number of sessions you will likely require to get lasting change. Andrew offers a Risk-Free Trial Consultation at the clinic. This is for those who are interested in trying it out but are unsure whether it can help them. The Trial Consultation gives you an opportunity to experience this approach before making any kind of commitment. This is a chance to see how the process works so you can decide whether it’s right for you to go ahead with a full course. The fee for the Consultation is €120.00. This fee is deducted if you decide to sign up for a course of lessons. If you decide that a full course is not for you, you simply pay the €120 fee for the consultation in reception. Whichever way you decide, Andrew will provide you with a follow-up email with specific instructions on how you can continue to apply what you have learned in your daily life. It can feel like a risk to place trust in yet another approach or practitioner. Especially if you have already thrown many thousands into furniture, equipment and therapies all of which you have been told are good for back pain, yet don’t provide much lasting benefit. If this approach makes sense to you, you can sign up for the recommended course. Andrew will help you arrange a weekly meeting time. When you sign up for the full course, the €120 consultation fee is deducted. These sessions are usually weekly. In some cases, a more frequent schedule may be recommended. This entry was posted in back pain, lower back pain and tagged back pain, chronic back pain, chronic lower back pain, lower back pain on November 3, 2016 by admin.